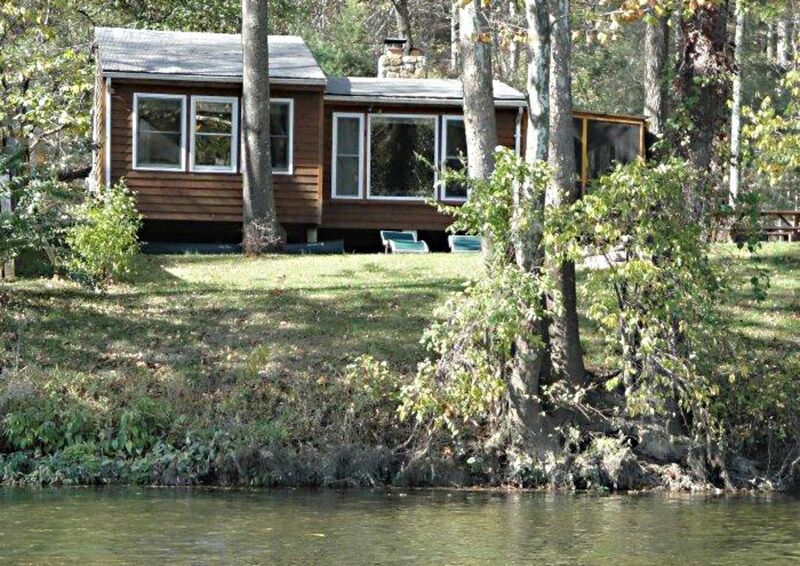 This beautiful two bedroom cabin sits on the Shenandoah River in Luray, Virginia, in the Shenandoah Valley. You can fish from the bank, paddle in the canoe, or watch the river flow by from the screened porch and hot tub. One bedroom has a queen size bed with large picture window looking out on the river. The other bedroom has 2 comfortable twin beds. The living room has a beautiful stone fireplace, satellite TV, DVD, stereo with CD player, and movies to choose from. The kitchen is spacious with dining table looking out on the river. There is ample storage for your food products, and we offer an equipped kitchen with coffee maker, microwave, toaster, and pots, pans, and dishes. Cell service is spotty but Sprint is most likely to work. There is a land phone for your use with no charge for continental U.S. use. New in 2017 , a new couch and loveseat, a new roof, and new stairs leading to the river's edge with a small platform for easy fishing. New in 2018 a remodeled bathroom. There is room for two vehicles in the driveway. There is a horseshoe pit for your enjoyment and a firepit. We don't provide firewood. We had an absolute awesome weekend in this lovely riverfront cabin. Had all we needed and then some. Beautiful views, serene surroundings but quiet and peaceful. Next time hopefully we can stay longer. I arranged for a weekend getaway for my husband and I as a gift and we had a wonderful experience. The hosts were warm and welcoming, the cabin was super clean, cozy, and provided for all the amenities we needed. We very much enjoyed sipping our coffee while sitting by the large picture window in the bedroom, looking out over the river. The fireplace provided for a relaxing, romantic evening. The hot tub soothed our muscles after a hike in the nearby forest and an afternoon exploring nearby Luray. We are looking forward to coming back in warmer weather so we can enjoy more outdoor activities on the river. Thank you so much! Very clean, great private location with views ...so cozy & everything you need is there . We would definitely return!